This is an updated version of the previous Tome Raider game. It's pretty much the same game with updated graphics, sounds and new types of bonus features. There's a 'Bejewled-like' element included, when you match lines during the free spins feature, the tiles explode dropping down the symbols above them which can then form new matching lines. Not only do you get the extra lines but you also get a bonus multiplyier for every successive match from that cascade. The if you spin in at least 2x free spin symbols. 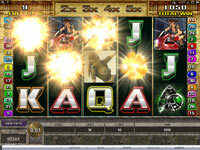 You are awarded free spins (from 2-100 depending on how many symbols are spun in). If the last 3 reels show this symbol it also adds a rolling reels feature to your free spins, any matching tiles explode dropping down the symbols above them which can then form new matching lines in a cascade effect. The wild symbol (portrait of Laura) will substitute itself for any standard symbol to match your lines (excludes the free spins and passport symbols). Unlike most bonus features which are activated by spining in 3 bonus symbols, in Tome Raider when you spin in a passport symbol in the middle of a reel, the top of that reel is lit and stays lit for as long as you're playing once all 5 reels are lit the bonus feature is activated. Be warned the passport symbols are quite rare so it can be quite a drawn out game before you active the bonus. The bonus game takes the theme of a treasure hunt where you pick your location and find the pieces of an ancient sword while avoiding traps.